Have you ever had the egg bites at Starbucks? This recipe is loosely based on it, but using higher fat ingredients in the base recipe to make them a bit more keto-friendly. I've included 6 different versions of them to give you ideas, but you can essentially just take the base recipe, use your creativity and run with it. Add eggs, heavy cream and cream cheese along with any additional cheese from your chosen recipe to a blender and pulse till smooth. Spread the add-ins from your chosen recipe evenly amongst the cavities of your silicone egg bites mould. Divide the egg mixture evenly between the compartments of the silicone mould, tightly cover with aluminum foil. Put the lid on the Instant Pot and be sure that the vent is set for sealing. Press the 'Steam' button and set timer to 10 minutes. It takes about 5 minutes for the Instant Pot to come to full pressure, then the display will show a countdown timer. Once the cooking time is up, allow the pressure to release naturally for 10 minutes, then release any remaining pressure, if any, before opening the Instant Pot. 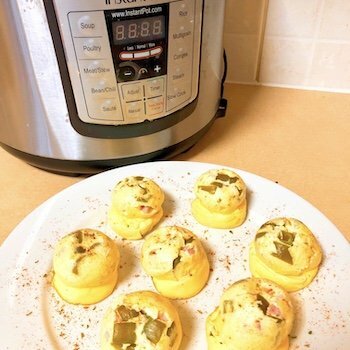 Remove the silicone mould from the Instant Pot and allow the egg bites to cool slightly before serving. 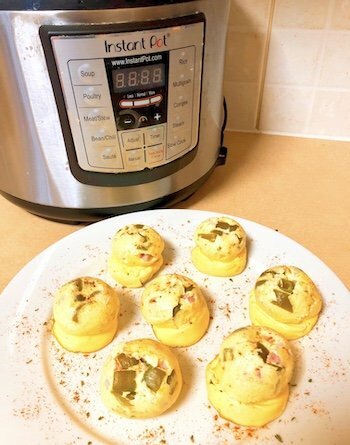 These egg bites can be stored in the fridge for up to 1 week. Simply reheat in the microwave for 30 seconds. They can also be frozen and reheated in the microwave for 1 ½ - 2 minutes.